Product marketing and positioning is something which I often take note of when searching for snacks. This offering by Morinaga appears to be one of those snack releases which is screaming "volume" at you, though the truth is that it's not so heavy as just "large". The box is 18.25 cm x 8.5 cm (7.2 in. x 3.3 in.) and the vivid yellow with bold logo is very eye-catching. This is part of what drew me to it while perusing the offerings at local convenience stores. This is available at many shops, but I bought it at Sunkus for 105 yen ($1.30). I imagine products like this are targeted toward young people, and men in particular. It's not so much the size, though that is a part of it. I think that snacks directed at women tend to have each piece individually wrapped so they can eat a small portion and leave the rest without fear of them going stale. Since this is six pieces in a tray, I think it's for bigger appetites (or for sharing). Each piece is only 30 calories which makes for decent portion control. 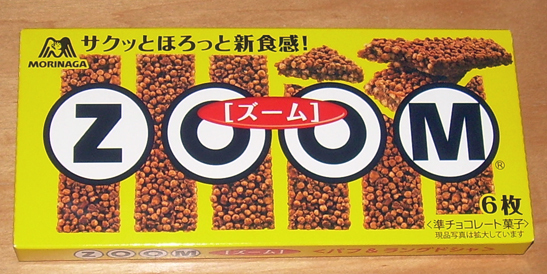 Though this is somewhat unusual for Japan, it's actually a variation on a crunch bar with less chocolate and more cookie and rice puff than candy. The small twist on this compared to similar bars is that this is made with bits of langue du chat cookies rather than something more pedestrian. Honestly though, I don't think that anyone could tell the difference with the small size of the pieces. They're tiny, about the size of a small bead, and I couldn't much tell the difference between the puffs and cookie pieces. I consumed this at room temperature, and while it didn't melt in my hand, the chocolate was rather soft and I felt that the texture would have been better if I'd had it cold (I refrigerated the remainder and will try it again). The taste was mild and enjoyable though. The chocolate is closer to a malty milk chocolate, though not as "malty" as something like Crunky. There's just enough "bite" in it to keep the chocolate present along with the flavor of the crunchy cookie and puffs. It's not strong, but still pleasant. I rather liked this and would be happy to keep a box of it in the refrigerator at home or at work to satisfy a particular craving now and then. It's not going to be a favorite, but I hope it isn't a flash in the pan and stays on the market for an occasional purchase. It's lighter than a chocolate bar, and sometimes that's the sort of sweet I want. 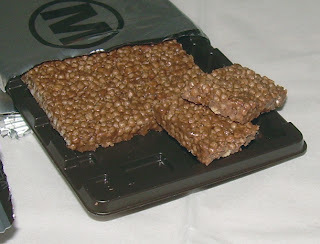 That so looks like 'chocolate crackles' that we used to make out Kelloggs Rice Bubbles when we were kids!... hmmm that brings back memories.